Twin peaks, Pilan has a dramatic summit. Skiing lower down on corn was the best. A small peak on Moskenesøya that has stunning views down to the sandy Klavika beach, but we were in the clouds. Big summit very close to the sea. A steep sustained climb to the dramatic ridge and a steep ski down in soft wet snow. Ordinary weather in Narvik. 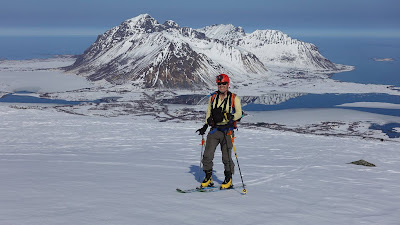 We skied up towards Narvikfjellet into the low cloud then down the piste. Great fish meals in Narvik! In the afternoon we drove to Riskgransen in Sweden - their highest ski resort. We were very lucky to see a spectacular display of the Northern Lights the night we arrive at Hopen. The display lasted for about 10 minutes and danced around the night sky. A triple helix band of fluxed and twisted directly over our heads. It was astounding. We were also very lucky to see two Moose close to the road. They are spectacular animals, both huge and nimble. 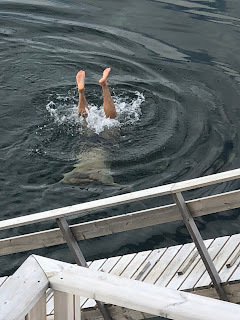 An otter swam past our cabin in Svolvaer. It turned to look at me then dived under the seaweed.